Hugh Price Travers was the son of Henry Fane Travers and Cecilia Price. Hugh was born in the Channel Islands about 1871. Hugh Travers resided at Grange Park, Moy for a time with his father, Colonel Henry Travers. Hugh Price Travers was a noted Rugby football player and gave his services on behalf of Dungannon Rugby Football Club for several years. 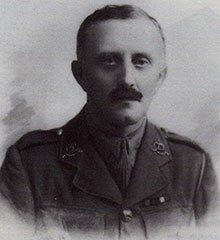 Major Hugh Price Travers was killed in action in Gallipoli on the 7th August 1915. He was 43 years old. Extracts and images are from the book ‘Gallipoli’ by Tim Travers. Tim is professor of history at the University of Calgary in Canada. 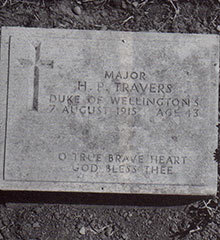 His great-uncle was Major Hugh Price Travers. 2 Book on Gallipoli Written by Tim Travers. Hugh Price Travers was his great uncle. 3 Forum listing Lists Travers family details.